The statue features famous Jesuit Missionary Fr. Pierre-Jean De Smet, S.J. praying over two American Indians dressed in traditional clothing. Last Monday, just two days after graduation, it was removed from the location it has called home on campus for decades. According to a SLU webpage, Fr. De Smet had an excellent rapport with American Indians. He was known to them “simply and affectionately as ‘Blackrobe. '” While converting thousands to Catholicism, Fr. De Smet also helped negotiate treaties among the Indians and the United States, ensuring their land and safety. Fr. De Smet also shares a connection to Saint Louis University, serving as its treasurer shortly after the university’s founding. Despite Fr. 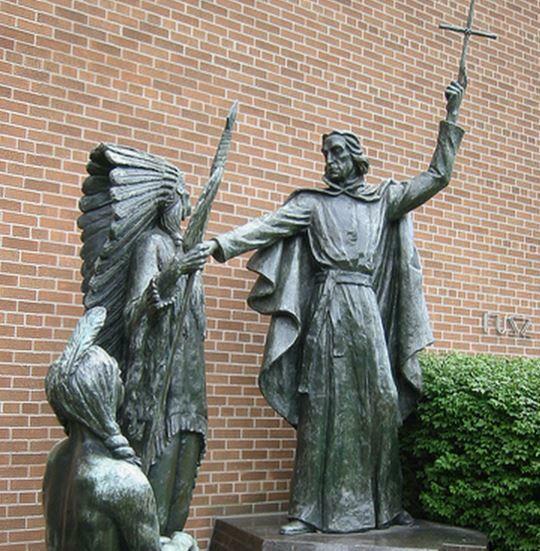 De Smet’s history, students still said the statue visually represents oppression. The statue’s removal comes just months after controversy broke out at the Jesuit campus over a proposed statue to commemorate a six-night sit-in that served as an extension of protests in nearby Ferguson. This article was written by College Fix reporter Nathan Rubbelke, a student at Saint Louis University, and is republished with permission.